Liaoyuan (辽源), Tonghua (通化) and Yanji (延吉) in Yanbian Korean Autonomous Prefecture. Jilin Province is one of China's three North-Eastern Provinces lying in the upper North-East of the country in what was formerly known as Manchuria. Neighboring Provinces are in clockwise direction - Inner Mongolia Autonomous Region in the West, Heilongjiang Province in the North, Primorsky Krai (maritime) Province of Siberia in the Russian Federation in the extreme North-East Corner, to the South-East, the Nation of North Korea and its restricted border to the East and South-East and finally the Chinese Province of Liaoning to the South. area on the North Korean Border. The Changbai Shan Park lies on the Chinese side but a part of the disputed Chinese-North-Korean Border is the BaiYun Shan or Paektu-San in Korean of 2691 Meters (2704 Meters). This Mountain is of Volcanic Nature and has the only Volcanic Crater Lake in the North-East of China, making it somewhat of a tourist attraction. Furthermore, it is of enormous importance to both South- and North-Korean Nationalism as well as to the Manchu Tribal Heritage. (About which more in the section on The Korean Ethnic Minority of China and Yanbian Korean Autonomous Prefecture and below). Other Mountains in the Area include the Longgang Mountains to the South-West of Changbai Shan (above Tonghua) and on the North-East side the ZengFeng Shan with 1675 Meters and the Selin Shan further away looming 1498 meters over Hunchun, a small city wedged between Russian Primorsky Krai and the North Korean Border near the endings of the Tumen River (into the Sea of Japan, locally called East Sea). From the Eastern Border inwards towards the Center of the Province the mountainous terrain continues towards Jilin City and the Capital of the Province at Changchun. In this Central Eastern Region we find the Erdao Lake and more to the North-West the Songhua River Reservoir. The Songhua River Reservoir is the end-point of the longest river in Jilin province which runs into the Lake from the North cutting from North to South through the center of the Province. The Mountains surrounding the Songhua Reservoir (or Lake) are famed, especially in South Korea, as sensational ski-resorts. There are two seperate area's available for skiing , the Songhua Reservoir Area itself, and nearby to the South the BeidaHu Skiing Area and Resorts. The upper reaches of the Songhua River run westwards along the northern border with HeilongJiang Province and ZhaoLai Nature Reserve before turning South towards the Province and Lake Reservoir. Climate in Jilin Province is somewhat extreme. The range of temperature is from -15 degrees in Winter to 35 degrees Celsius in summer respectively. Average temperatures in Januari range between -20 and -14 Degrees Celcius. In winter snow covers much of the mountains and province and due to the frigid winter conditions Jilin is known for its very own Ice Festival including ice sculptures. This main tourist event of Jilin City occurs in Januari at the same time when vapor from the heated river refreezes on the branches of Pines on the River Banks, creating a sparkeling display of diamond-like lights. In General winters are cold and harsh, whereas summers are hot and short. Rainfall averages at 350 to 1000 mm per year. The North-Eastern Provinces and there-in Jilin are vital to China's economic base. First and foremost Jilin Province agricultural output is among the largest of the Nations Provinces. Jilin Province, and especially Yanbian Prefecture are famous for their rice production. Other products of Jilin Province include Millet, Corn (Maize) - in the year 2007 AD Jilin produced 17.8 million tons of corn -, Soy Beans - Jilin created the first breeding soybean of cytoplasm-nuclear male sterile line from interspecies cross in the world, Oil Plants, Red Peppers, Beef and Bulls. Jilin Province is the largest producing area of ginseng in China growing 85 percent of Ginseng output in the Nation, and 70 % percent of the world's production. Historically among the main natural products of Jilin were various natural furs, among whom first and foremost Sable Fur. The Sable hunt however banned and the animal is now a first-class protected animal on a National Level. Sable Furs traditionally regarded the best of all types found in Jilin are no longer available, and trade in furs or even the killing of a single animal will result in harsh penalties. Since 2007 Jilin Province aims to become the country's fifth-biggest grain producer after Henan, Shandong, Jiangsu and Heilongjiang provinces. Although nearly the entire Peoples Republic of China including Jilin are currently suffering from drought conditions, the Province hopes to increase its grain output by more than 5 billion kg within the next five years. For this reason the Provincial Government has invested large sums of money in 10 major projects for water diversion, drastic expansions of the irrigated area of Jilin's central and western regions and further mechanization of farming. Yield is further to be increased by the introduction of improved seeds and the use of advanced farming techniques, the technology and knowledge of which has been imported from around the world. Experts have expressed optimism for the average grain output per hectare of land to increase given sufficient irrigation. This however is exactly the problem at the moment. In order to examine possible solutions for the lack of rainfall in the North-East a national artificial rainfall demonstration zone will be constructed in Songhuajiang Valley, Jilin, according to the plan. The project is expected to increase rainfall by 1 billion to 2 billion cubic meters annually through weather modification, a.k.a. "rain seeding". The Bulls of Da'An City and the Kerqin Plain Areas of Western Jilin Province are famed in the North-Eastern Region. Dairy Farming and the Herding of sheep are other important agricultural activities in the western parts, with sheep herding especially based around Baicheng prefecture-level city. Mushrooms are also found in abundance throughout the hills and mountains of the Province. Jilin Province cities are manufacturers of transportation equipment in use nationwide and the North-Western City of Songyuan is vital to the nations oil and petrochemical industry. In general one could say that the North's Industries are largely complementary to each other since Jilin Province further has an impressive mining industry, providing raw materials not only for its automobile industry, but also for export to other Chinese Provinces, North Korea and elsewhere abroad. Among the abundant mineral resources are oil and natural gas, coal, iron, copper and gold. Last but not least, there is some lumber industry based around the mountains in the East and South-East and the Changbai Shan Nature Reserve. The Mountains of the south-east are rich in (Pine) forest resources and Changbai Shan is an important area for the production of traditional Chinese herbs as well. Deer antlers, derived from Jilin's abundant spotted deer, are used in Traditional Chinese Medicines of which the province is a large contributor. Moving past the Capital Changchun eastwards the terrain flattens out somewhat, the heights slowly retreating towards the North-West and a region known as the Songnan Plain in which lies the large and prosperous Oil and Gas City of Songhua and the smaller Border City of Da'An. Among the various different ethnic groups that live in the province are first and foremost Han Chinese majority, all immigrants from the Central Chinese Plains. Then there are Ethnic Minority groups of the Hui, Mongols or Mongolians, the large Ethnic Group of the Koreans and last a small group of Xibe and Manchu. In Total there members of no less than 49 of China's 56 Ethnic Minority groups registered as citizens of Jilin Province, a multi-ethnic province. All ethnic groups combined provide a total population of 27.085 million, some scattered but many residing in their own distinct ethnic communities recognized by the Provincial and National Government. Main Railroad and highway connections through the Province run from South to North, connecting Shenyang - the Capital of Liaoning Province, through Changchun - the wartime Capital of the Japanese in Manchuria, to Harbin (or Haerbin) - The Capital of HeilongJiang Province, China's Northern-most Province. North of Changchun this main railway line leads north-west to SongYuan, the largest oil, gas and petrochemical industrial city in the Province from where it continues on through Da'An to Harbin in HeilongJiang Province and other destinations in the North-East. In another direction, westward, a railway from Songyuan and Da'An through Baicheng leads directly into the plains of large Inner Mongolia Autonomous Region. Trains connect eastwards from the central Capital at Changchun towards Jilin (City), JiaoHe', Dunhua and the far North-East corner of the Province stringing along secondary population centres that stretch out eastward from Jilin along river valleys towards the Yanbian Korean Autonomous Prefecture and the Tumen River on the North-Korean Border. Although sparsely populated, Yanbian Korean Prefecture is the home of 2.2 million Chinese, among whom the majority of Ethnic Koreans in the Nation. Although in the past mainly an agricultural and remote rural area between mountains, the Korean Prefecture bosts no less that 6 cities, and has the highest rate of education in the Province. 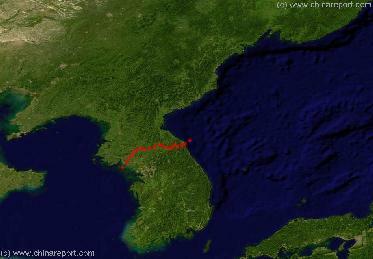 The Central Eastern Province and its border with North Korea are to be considered very rough both in terrain and climate and these regions are therefor sparsely populated with only a few small towns and mainly agricultural villages. The Main Section of Land and High Mountains along the North Korean Border are taken up by the Changbai Shan Nature Reserve with its Volcanic Mountain and Lake. This is the highest point within the Province. From Changbai Shan Nature Reserve in the East, mountains gently wind down towards the west of the Province. In 2005, the total road mileage available in Jilin Province reached 50,308 kilometers, with a road density of 26.8 kilometers per one hundred square kilometers. 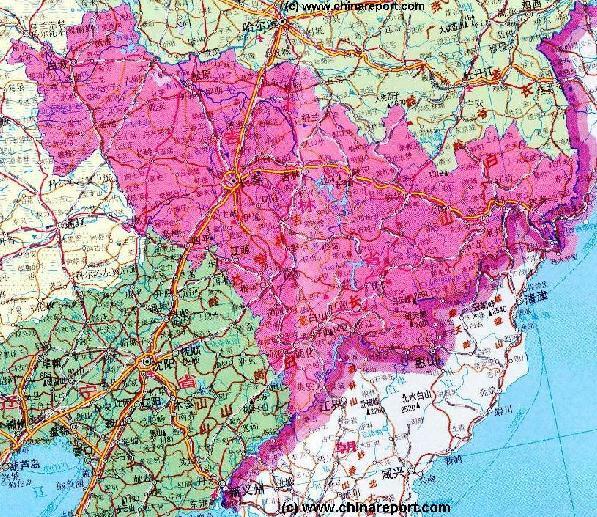 Except the Yanbian Korean Autonomous Prefecture in the far North-East, all Prefecture-level cities of Jilin Province are connected to Changchun with highways (arterial road) and from the Capital City of each Prefecture secondary roads connect throughout the counties. To be exact: In 2005 AD the freeway mileage available in Jilin Province was 542.5 kilometers; grading road mileage was 48,487.2 kilometers, county-countryside mileage reached 37,092 kilometers. The Main Tourists destinations within Jilin Province include Songhua Hu and BeidaHu Ski Resorts south-east of Jilin City, the Changbai Shan Nature Reserve and its BaiYun Shan (Paektu-San) Volcano, and various small Cities along the Tumen and Yalu Rivers on the North Korean Border. In the Past 10 to 15 years these were the most visited sites. However, the western regions of Jilin, especially the City of Da'An and Chagan Lake are seeing increased visitors over recent years. In 2009 AD sections of the Great Wall of China were identified in Tonghua County of South-East Jilin Province, adding a historic location to the Tourist Itenerary. Read the Full Story on the Highlights, Monuments, Landmarks and Scenic Sites of Jilin Province - Click Here ! In ancient times, well before the birth of Christ, Jilin was inhabited by various nomadic peoples together designated as the Khitans. The most noteworthy of these Tribes were the Mohe, a Tungusic People that lived near the Jiao River (currently in Liaoning Province), and the Wùjí (勿吉). The Mohe were briefly independent somewhere between roughly 240 AD and 280 AD. Not much thereafter they were absorbed into the Goguryeo Kingdom which had arisen from territories in Jilin Province. Sporadic archeological finds are all that remains of these early inhabitants. Although founded as early as 200 BC, the Kingdom came to its 1st recorded existance in 37 BC. 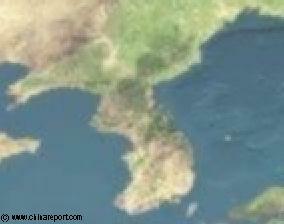 By many Koreans is it is considered the first State on a Korean Ethnic Basis in history. 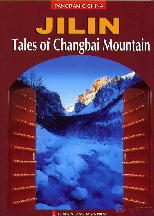 To Find out More - Read the Full History of Jilin Province - CLICK HERE ! more natural beauties and resources available in the area. Just South-East of Da'An lies the Chagan Lake of the Jitong River (and Valley) a huge fresh water supply ranking among the 10 largest fresh water lakes in China. North-West of the City is the location of the Moon Lake, a man-made collection of lake reservoirs for agricultural purposes and a hydro-electric dam. Just across the border lies the Zhalong Nature Reserve, one of the biological wonders of HeilongJiang Province. The North-West is slowly becoming one of the main tourism destinations for internal tourism within China, due to its abundance in scenery and over twenty historical and natural sites to enjoy in the Area. The Korean ethnic group lives mainly in the cities of Yanbian Korean Prefecture, Jilin City, Tonghua and Baishan; the Mongolian ethnic group and Xibo can be found in the West in Baicheng and SongYuan; the Manchu and Hui (Muslims) live in Changchun, Jilin, Tonghua and Siping. Apart from these larger communities there a further 33 townships and towns under local administration by the minorities inside of Jilin Province. For More Details on Ethnic Minorities of Jilin Province - Click Here ! Maps, location and directions + backgrounds on the Ethnic Communities in Jilin Province. Find an Ethnic Minority in China? 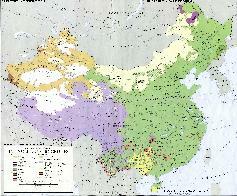 - Map of Language Distribution in China (PRC). By the end of 2005 AD, the total population of Jilin Province was 26 Million 69370, among which the urban population of counted 12 million plus. (The Rural Population was 14 Million 630 thousand 500). The current population of the Province is around 27 Million. The Main Cities of Jilin Province are first and foremost the Capital City of Changchun lying Centrally within the Province, and nearby City of Jilin due East of the Capital. 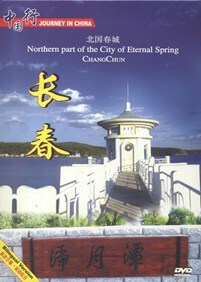 , Dunhua and Yanji - the Capital of Yanbian Korean Autonomous Prefecture, extending west from Changchun and Jilin. In the South there is the City of Siping, located on the border between Jilin and Liaoning Provinces about halfway between Shenyang and Changchun along the main railway line and highway connection in the Area. Nearby lies another population center, the gritty coal mining town/city of LiaoYuan, of roughly 460.000 souls. In The South-Eastern Corner of the Province lies the City of Tonghua a small industrial town of 300.000 souls and railway hub connecting to ChangBai Shan Nature Reserve and home of the Museum to the War of Resistance Against Japan plus some other historic sites. In the North-West corner Of Jilin Province the major population center is Songyuan, a giant industrial city famed for its Nationally vital oil and petrochemical industry. Intended as a vital transportation hub built at the very point where the rivers Songhua and Nen Meet. Songyuan, enriched by its heavy industry currently counts no less than 2.8 million citizens and apart from the river Songhua, 5 railroads and 6 provincial highways pass through the City. Somewhat further west lies Baicheng, only fairly recently established as a real town or city but important for its textile industry as well as being one of the four main railway junction cities in China. Baicheng is known by the Mongolians as Chaghanhot, and used to be a part of HeilongJiang Province. It counts around 330.000 Citizens among whom many members of the Mongolian Ethnic Minority of China. There are more than 2000 rivers sized big to small throughout Jilin Province. All these Rivers belong to one of the five main water systems consisting of the Songhua River, Liaohe River, the Yalu River and TuMen River on the North-Korean Border in the East, and the Suifen River. The total volume of water resources is 40.4 billion cubic meters derived from both above ground and underground sources. The Most well-known and renowned among the many historical Industrial products of Jilin Province are the Red Flag Sedan Limousines of the post-revolutionary period in the 1950's, 60's and 70's in China. The Red Flag cars or Hongqi (simplified Chinese: 红旗) are the exclusive luxury car series produced by the First Automobile Works FAW (of China) in Changchun City. The Factory was established in 1958 AD, going on to provide the exclusive and enigmatic soviet style automobile transport used by China's Highest Leadership in Beijing during the heydays of the Cold War. 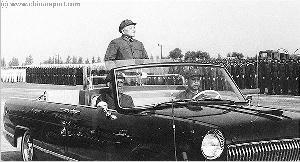 Deng Xiaoping, in a Red Flag Sedan, during the Grand Military Review, on May 1st 1981 at TiananMen Square, Beijing. FAW was one of China's industries that underwent a dramatic modernization after China's opening up policy was announced in 1985 AD. Today it is still a producer of high end luxury cars and limousines in China. Less glamorous but not less significant products originating in Jilin were China's first synthetic rubber, the first microscope, the first optical glass, the first ruby laser, the first railway train and subway electric train (The LRT - Light Railway Transit system of Changchun - See Public Transportation in Changchun City) and the first high resolution nuclear magnetic spectrometer of China.